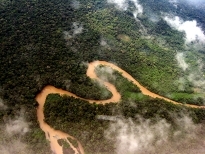 The forest is protected through a three-step approach. We surveille the trees' legal, physical and social protection. We are currently awaiting precise wordings concerning our first local partnerships, which need to be approved by all parties and local lawyers. Our land partners are responsible fort the trees’ protection while we use our experience with protection measures to rate and surveille their protection approaches. Please come back soon to read about the exact system. The legal protection strategy depends heavily on the country and region and covers for example to lobby for natives- and environment-friendly laws. To make sure the trees are physically safe, the forest area is monitored by satellites and patrolled by rangers to detect changes early enough to be able to react and intervene. Only with a future perspective besides the wood industries there is a chance for a lasting protection. Because of this, we want to see local development projects involved in protection measures. This tree is protected by an anonymous protector! This tree is protected by ! You are protecting this tree!